Looking for a local Hotspot in Cherokee, NC? You’ve found one! Not only are we known for our amazing wings and pizza, but we have the best grill around. Want somewhere to eat with a family atmosphere and great service? We love our community and strive to add something special to Cherokee. We aim to please and want our customers to remember our yummy food and great service. You will often find the owners, Thomas and Norma, hanging around tables talking to customers and making them feel right at home. Walk in for some good food and walk out with a new family! Friendly and Personal Service! All of your favorite American Cuisine, New York Style Pizza, Black Angus Burgers, Stromboli. 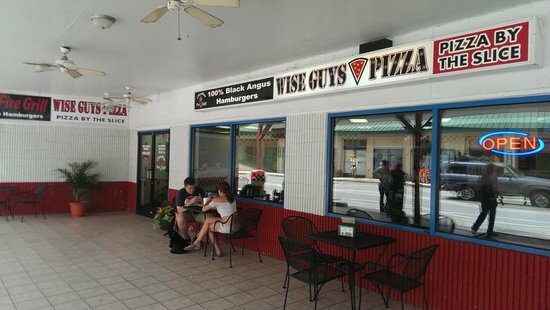 Wize Guyz Grille serves local flavor with a lot of flare in Cherokee, NC. Stop by for one of our All-Natural 1/3 lb Black Angus Beef patty burgers, Jumbo Chicken Wings with unique and original Flavors, chicken tenders, pizza by the slice, and construct your own stromboli or pizza pie. A fan favorite is the “All the Time 16”, a 16-inch cheese pie for only $9.00. See our menu for all of our offerings. We have become a local hot spot since our opening in early spring of 2012 and known for our high-quality food, guest service, and a comfortable atmosphere. We are located in the Teepee Village across from Saunooke Village at the intersection of Big Cove and Acquoni Rd. In Cherokee NC. We have plenty of parking and tour buses are always welcome. If you are expecting to bring a large group and can let us know ahead of time that you are coming (few days advance) with an expected time, we will be sure to have extra staff on hand. We appreciate your understanding.